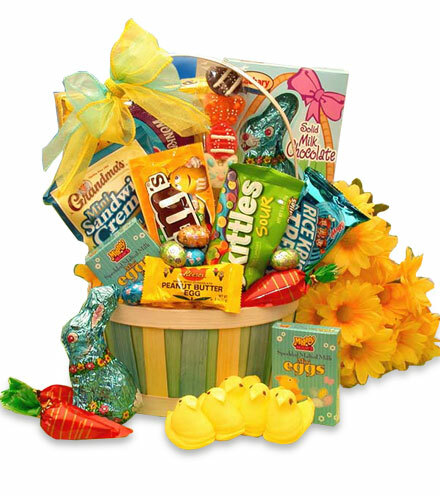 Say Happy Easter with style and taste with this tasty Easter Surprise of Sweets and Treats Gift Basket. Filled with delicious treats, your friends and family are sure to adore you for your generosity and thoughtfulness. The Easter Surprise of Sweets and Treats Gift Basket includes: A pastel spring wood-chip basket, Peanut M & M candies, Tropical Skittles, Grandma's cream filled cookies, Malted eggs, Rice Krispies Treats, Wonka's Sweet Tarts candies, Easter marshmallow Peeps, mini Reese's Easter egg, 6 foil wrapped milk chocolate Easter eggs, mini carrot with jelly beans, A 8" jelly and marshmallow Easter scene sucker and a Milk chocolate foil wrapped bunny. Finished with a hand made bow and delivered with your Happy Easter Wishes! This gift weighs 4 pounds complete and measures 13" tall by 6" wide.